OMG y'all. 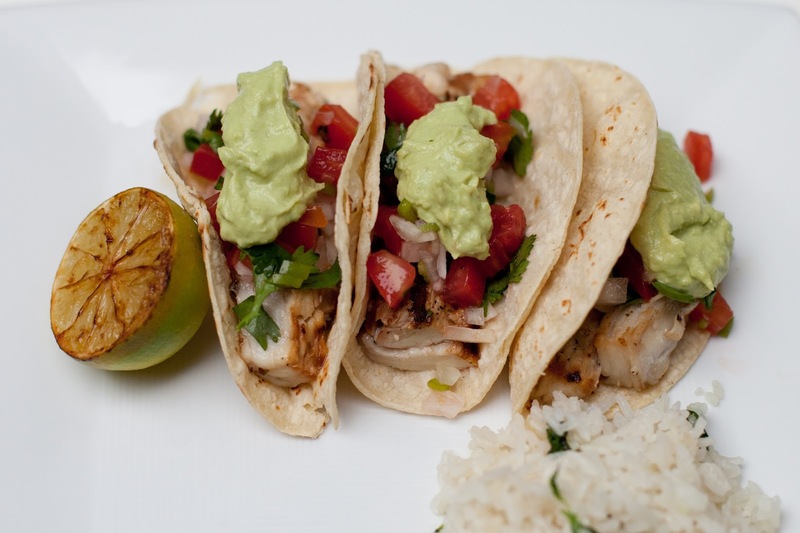 We have a new favorite fish taco recipe. I mean, margarita is in the title. How could they not be a hit?? Also, I busted out the grill pan for these tacos and it made all the difference. Husby and I (and little man) polished off over a pound of fish - that's a lot, right? It was that good. The whole meal had a tropical vibe - perfect for summer. Or, for winter when you are dreaming of summer! Start by making the marinade for the fish. I love that this can be done ahead of time (a win for this mom!). The marinade is based off a Rachel Ray recipe from her June 2015 magazine. I say "based off" because her recipe was a bit involved. For instance, she instructed that the marinade be pureed in a food processor. This mamma had no time for that! I was chopping all the ingredients anyway, so I skipped the food processor step (saving extra dishes along the way, score!). I also skipped the cumin in the recipe because I've been feeling a bit overloaded on that spice lately. What I did mix together was cilantro, tequila, lime juice, vegetable oil, Grand Marnier, agave, and garlic. I put the marinade in a gallon-size ziplock bag and added the mahi-mahi I had picked up at the fish market earlier in the day. I don't think I had ever cooked mahi-mahi before (I usually pick up halibut or cod) but Rachel Ray used mahi-mahi, and they had it available when I went to buy the fish, so I went for it! When it was time for dinner, I heated up the grill pan on the stove and grilled the corn tortillas until they charred a bit. Ohmygoodness, this took them to a whole new level. Then I just took the fish pieces out of the ziplock back and grilled them directly on the grill pan. The fish was fantastic. And made even more delicious after a squeeze of grilled lime. Ten points for Rachel Ray. I must say, her recipes are hit or miss. Some I make once and never again, and some I live for. Her pumpkin peanut butter scallops? I was brave enough to make those and they are still my favorite fall dish. I did a pico de gallo made of tomatoes and white onions from our CSA basket, plus cilantro, lime juice, and salt and pepper. I didn't measure anything, I just mixed until it looked right. I also made an avocado crema (avocado mashed with a little sour cream and lime juice) - again, no measuring, just to taste! I do like to use a citrus squeezer when I'm preparing tacos because I find myself using so much lime juice. I kind of wish I had also added cabbage to the tacos so they had a bit more crunch. Coconut rice was the perfect accompaniment to these tacos. To make the rice, I heated up a teaspoon of oil in a saucepan, and used it to coat the rice. Then I added the salt, a cup of coconut milk, and a quarter cup water. I brought it all to a boil, stirred, then covered and let simmer for fifteen minutes. I stirred in some cilantro right before I served it. Well, the fish was being marinated in margarita ingredients. Everything to make a margarita was literally out on the counter. I had to make margaritas. I was just being pragmatic. 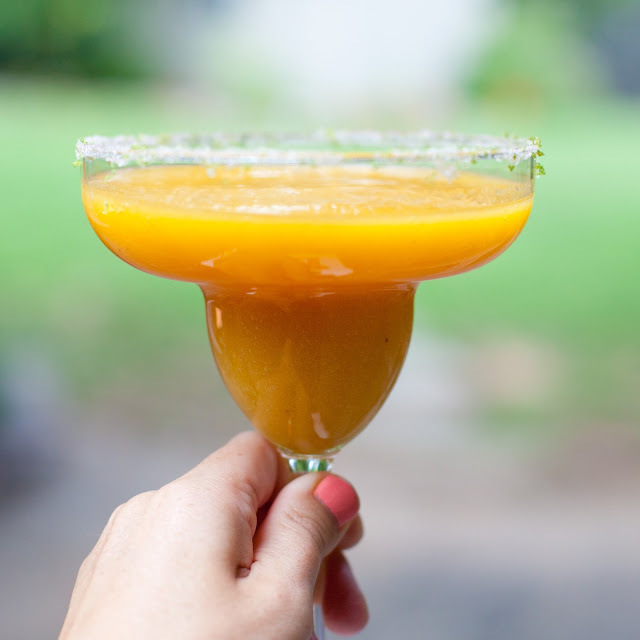 Instead of a regular margarita on the rocks, I switched it up and made frozen, blended mango margaritas. I loosely followed The Pioneer Woman's recipe found here. I had fresh mango on hand so I used that, and I switched out the triple sec for Grand Marnier, and the sugar for agave (since I had those items out for the margarita marinade). I halved the recipe, but it ended up being really strong still, so I added a bunch of frozen banana. Banana sounds crazy in a margarita, but it was actually the perfect addition! It balanced them out and made them super creamy. Seriously, I felt like I was on an island! Partly because I feel I only order frozen drinks while on vacay, and partly because the margarita was so delicious. Combine first eight ingredients in a bowl and whisk (or, puree in a food processor). Pour marinade into a gallon sized ziplock bag. Season the maui-mahi with salt and pepper and add to the bag. Seal and refrigerate until ready to grill (at least 20 minutes). When ready to serve, heat a griddle or grill pan over medium high. 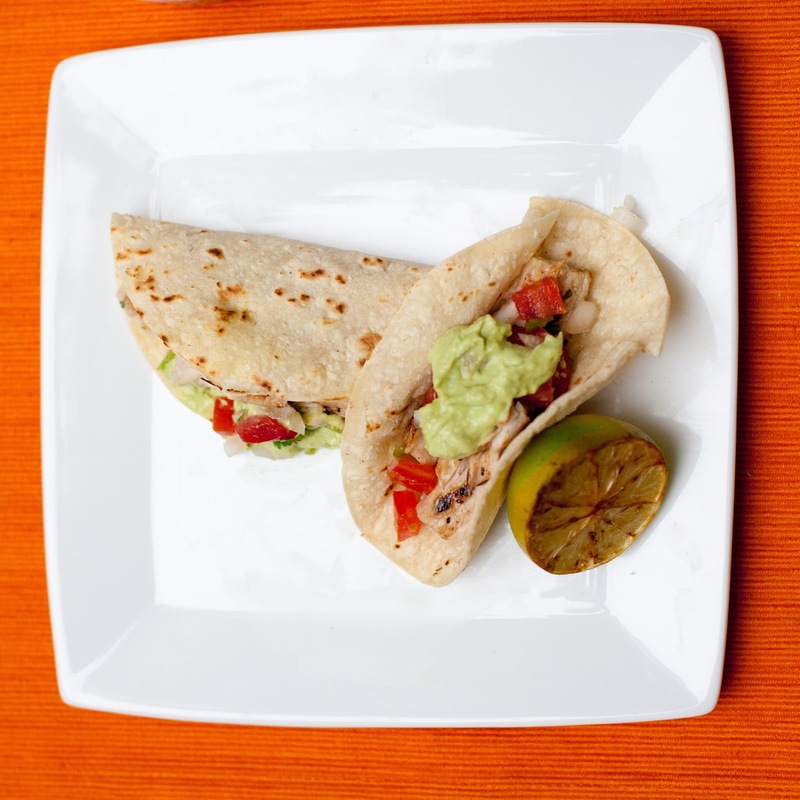 Start by charring the corn tortillas (30 seconds per side) and wrap to keep warm. Next, grill the fish and lime halves (3-4 minutes for lime, 7-8 minutes for fish). Fish should be firm and browned at the edges. 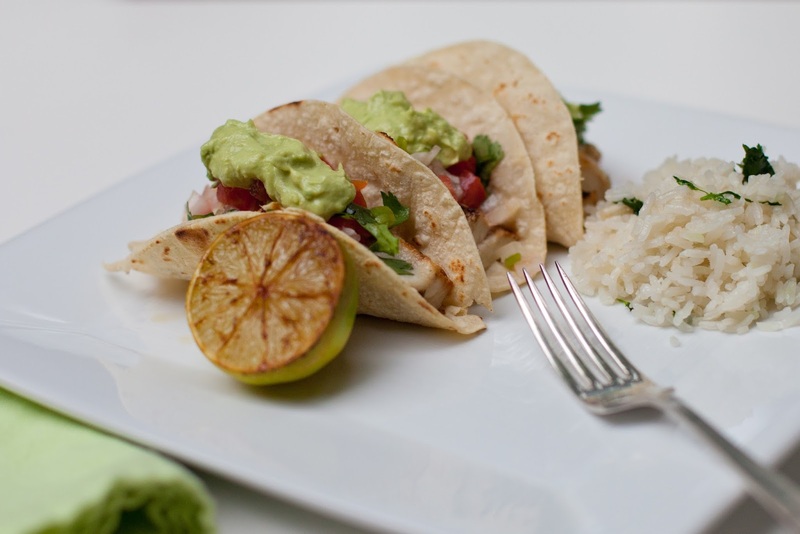 Transfer fish to a plate or platter and squeeze lime on top before using to assemble the tacos. Top with pico de gallo and avocado crema. Heat up a teaspoon of oil in a saucepan, and use it to coat the rice and salt. Add a cup of coconut milk and a quarter cup water. Bring to a boil, stir, cover and let simmer for fifteen minutes. Fluff with a fork and add chopped cilantro when ready to serve. Margarita as part of the taco?! This might just be the best one yet! Awww, thank you!! Definitely my fave in the "seafood" category! WHOA. This just blew my mind. I'm now drooling all over my keyboard. Hello tacos!! Love your tacos!! I need a BBQ!! LOL....And who doesn't love Margs!? !